Jim Nyquist likes to use the phrase “inflection point” when he talks about the Industrial Internet of Things (IIoT). An inflection point is when the direction of a curve changes in response to an event, resulting in significant change. 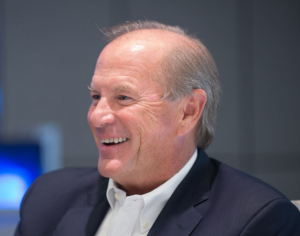 The industrial manufacturing sector is at an inflection point right now, and in his role as President of Systems and Solutions at Emerson Automation Solutions, Nyquist is at the center of the inflection point. 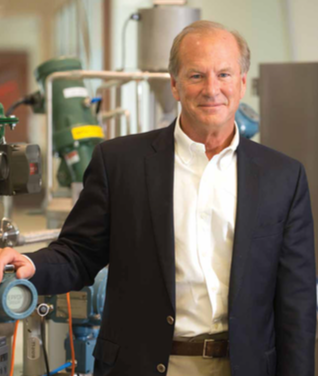 Emerson Process Systems & Solutions has $2 billion in annual revenues and 10,000 employees. It’s headquartered just north of Austin in Round Rock and is part of Emerson. (NYSE: EMR) They design software (the brains) and manufacture hardware (the muscle) to run automation systems for refineries, platforms and manufacturing plants. Some of the industries they work in are oil & gas, pharmaceuticals, chemicals, refining, wastewater, power generation and food & beverage. While manufacturing in the United States has lost five million jobs since 2000, in the last six years nearly 500,000 manufacturing jobs have been created, according to consulting firm Headlight Data. Those new manufacturing jobs are all in the industry sectors Emerson serves. After he received $60 million from the Emerson board for a new campus a few years ago, Nyquist returned with his hand out once again. This time he wanted another $7 million to build an innovation center—a living lab for customers. The innovation center was built and today hosts over 150 current and potential client visits a year where technical information exchanges, or TIE meetings, take place. Long-term customers like ExxonMobil and Shell send in about 20 people for three to four days every year to talk about their needs and what technology Emerson is developing. During one of the TIE meetings with Exxon, Emerson engineers conceived a new way to build a control subsystem. “The way it used to be done was to wire everything and bring the wires in from the field sensors, put those on a bus bar or wiring pad, then crosswire those into the right part of the control system,” said Nyquist. Following the physical cross wiring, design changes brought rewiring and then more rewiring after final modifications in the field. Another TIE conversation brought about a significant advance in building out control systems via software technology. “When we build a control system for a project, the first thing we’d do was build a small cabinet with a control system so we could start programming the exact application or operation,” said Nyquist. Eventually, Emerson would construct the full system on a staging floor and build out the software for every stage of the system. Then, the client would send people to check and test the hardware and software, making sure when each valve opened, the right thing happened. It’s called a factory acceptance test, and it takes a lot of time. “Now there’s new technology where we can take a control system and virtualize it into one work station, so we don’t have to physically build the control system at all,” said Nyquist. Instead of Emerson spending months building the test, it can be built in a day in software and sent to the client so they can check it on a terminal anywhere in the world. Inside the innovation center, a classic marketing play goes on every week where listening and learning from clients leads to solving their biggest challenges. From Nyquist’s perspective, there are three pieces to the Industrial Internet of Things. “First are smart devices that can gather data and have something to say; second, you have all the connectivity that gets all that data securely somewhere, and third is the whole software and analytic infrastructure,” he said. A skid has been constructed inside the innovation center showing visitors the sensors (in blue) that are measuring levels, ow, pressure, temperature, and the composition of what’s in the ow stream. It’s also measuring corrosion and vibration. The sensors are all smart microprocessors delivering information on up to 60 things. Sensors can be wired or wireless and it all talks back to the control room. The control room gathers all the data, processes the data points via algorithms, and sends a signal back to the valves (in green). It’s all guided by software made by Emerson in Round Rock. As an example of how their systems work inside a refinery or platform, data is being gathered by scanning thousands of pieces of equipment every second. 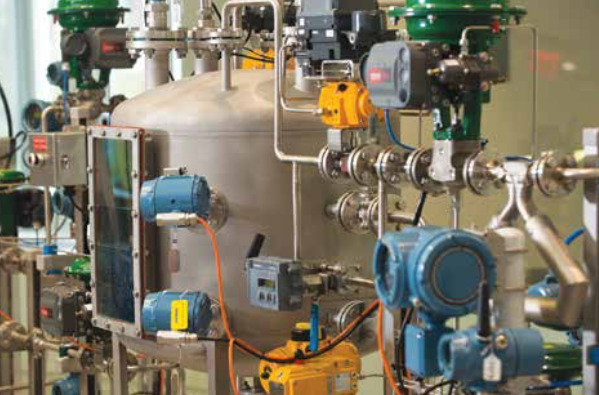 Inside a manufacturing plant there may be 50 measurement devices—and inside a refinery, anywhere from 20,000 to 30,000 measurement devices. When a vibration is picked up, the problem could be a bearing, lubricant or alignment malfunction. Because things fail in a predictable way, the smart devices tell operations what’s going wrong. The analytics will tell the operator what the outcome turned out to be the last time the vibration in this type of equipment occurred. This predictive diagnostic can avert equipment failure and get a fix before the equipment goes down. By moving to the next level and using cloud computing, along with more data and higher computing power, companies can look at how an entire plant is operating at any given moment. And, of course, there’s an app for that. Emerson recently released DeltaV Mobile—it provides all the alarms, trends and data and sends it to smart phones. It might be possible, but does IIoT make sense for smaller businesses? In a recent survey of Industry Week readers, nearly 60 percent said they were looking at pilot IIoT projects, but only five percent could justify starting a project and spending the money. Nyquist is an advocate of starting small and taking on a scalable project with a high ROI. In the simplest of terms, Nyquist sees IIoT bringing safety, optimization, emissions control and energy usage improvements to increase the efficiency of the operation. In the ultimate play in the process manufacturing industry, Nyquist can also see the day coming when no one will need to be onsite. When asked about the most innovative project he’s worked on, Nyquist answered quickly: a project for Shell called “the Prelude.” It’s a gas liquefaction plant on a ship. The project, built in Korea, is floated to a location off the coast of Australia. It produces gas and cleans it and liquefies it on the ship. Then the liquefied natural gas is offloaded when an LNG tanker pulls up, takes delivery in the ocean and pulls away for transport to China or Japan. Emerson set up the control center for the Prelude in Perth, and Shell runs it from Australia. Nyquist predicts the business cycle for the process manufacturing industry is starting back up from its three-year down cycle, although he sees the price of oil continuing to be a headwind. Houston 2018 Economic Forecast: Acceleration Owner CEOs: Are You Selling or Are You Bringing on a Partner? People are the key: how they want to live, how they get the data, the relevance of data they get, and the decisions they make on the information they receive. IIoT can give users the options if done right.